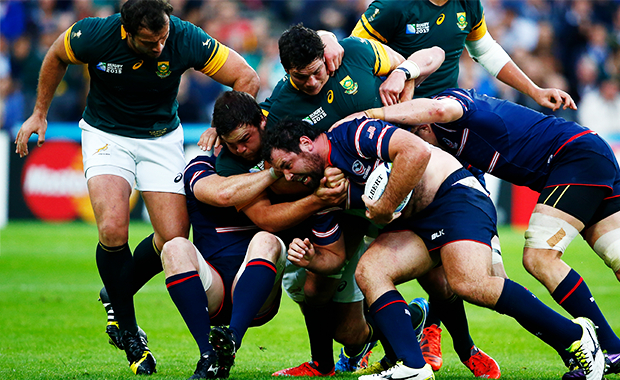 From September to November 2019 The USA Eagles will take their place alongside New Zealand, South Africa, Australia, France, Ireland, England and more, at the inaugural Rugby World Cup to be played in Asia. 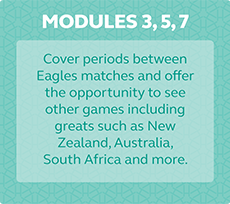 We have broken down the six weeks of Rugby World Cup 2019 into 12, stand alone, or combinable “Travel Modules”. Carefully read what each “Travel Module” includes. 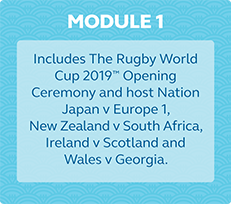 Every Travel Module can be purchased from a range of categories and includes at least 2 nights accommodation, transportation with corresponding Rugby World Cup 2019 match tickets. You can choose to take as many Travel Modules as you want, or just one. If you have your own match tickets and just want to join our tours for the camaraderie, atmosphere and local know how, that’s fine also. Look at the USA Eagles Tours Travel Planner below. Decide which Travel Modules suit your travel plans and scroll down and view the “full Details’ icons associated with Modules of your choice. Once you have reviewed the Travel Module details and inclusions you can click on the Travel Module/s of your choice and complete the booking and payment forms. 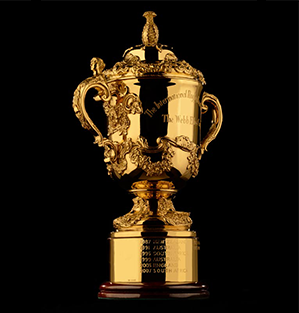 You will be on your way to Rugby World Cup 2019™ Japan. Read carefully what each Travel Module includes, they are all different. Look at which Travel Modules include Rail passes for travel to, from, within and/or between venues. 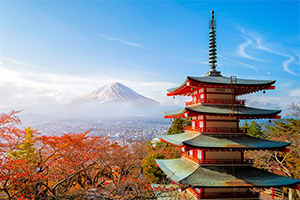 Study the USA Eagles Tours Travel Planner below, check out the venue locations across Japan and click on the first Module of your choice. Read carefully what each Travel Module includes, they are all different. Look at which Travel Modules include Rail passes for travel to, from, within and/or between venues. Don’t forget if you book your International airline flights at a later date, with USA Eagles Tours, we will meet you at one of our 4 designated Airports in Japan and assist you with your onward transfer to your accommodation. Four (4) nights accommodation in Tokyo including taxes and breakfast. Check in Thursday September 19, check out Monday 23, 2019. Two (2) nights accommodation in Osaka including taxes and breakfast. Check in Monday September 23, check out Wednesday. Note: If you are joining Travel Module #2, also in Osaka, from Travel Module #1 you will remain in the same hotel in Osaka if you book the same category. Tokyo Stadium for Rugby World Cup 2019 Opener Japan v Russia. International Stadium Yokohama for New Zealand v South Africa. International Stadium Yokohama for Ireland v Scotland. coach to your accommodation in Osaka. (Approx. 1 am (late) arrival at the hotel). (e) Wednesday September 25; Your rechargeable Rail Transit card will have credit already loaded o cover the costs from the closest rail station to either of the Osaka Central train stations. From there, connect via JR Line direct rail service to Kansai International Airport or connect via the airport Monorail to Osaka (Itami) International Airport. If you are continuing on to another city on the bullet train from Osaka Central Station you can use the remaining credit on your rail card in the next city you visit. 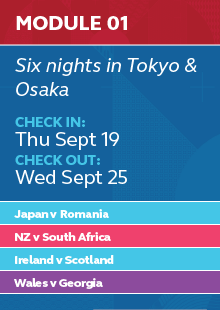 Option to purchase One (1) Category B or One (1) Category D match ticket per module purchased, per traveller to Japan v Russia, New Zealand v South Africa, Ireland v Scotland and Wales v Georgia. Your Travel Module package price includes all ticketing, administration and distribution fees. In each of the USAET hotels we will have an information and match ticket distribution desk. Where several hotels are close together we will allocate a convenient central location serving all hotels. Rechargeable rail transit cards will be distributed upon check -in along with match tickets at the USAET information desks. Due to the fact guests will be arriving from multiple airports/stations at varying times and on a variety of airlines/trains we do not include transport to the hotel on day 1. (Thursday September 19) We will supply full detailed directions prior to departure. The following are our suggestions. From Airport baggage claim (all terminals) directly to hotel lobby via Airport Limousine bus, (Approx. 2 hours travel time). Limited service, cost approximately US$31, bookable with cash (YEN) and credit card upon arrival or in advance on the Internet. Alternate option is the Narita Express Airport train departing all termainls for Tokyo Central Station (Approx. 1 hour travel time). Half hourly service, current cost US$32, bookable with cash (YEN) and credit card upon arrival. Then either local train transfer to the closest station to your hotel or taxi. From Airport baggage claim (all terminals) directly to hotel lobby via Airport Limousine bus, (Approx. 1 hours travel time). Limited service, cost approximately US$10, bookable with cash (YEN) and credit card upon arrival or in advance on the Internet. Alternate option is taxi. Approximately US$60, 30 minute travel time. USD$2,195.00 per person share twin/Double. USD$2,595.00 per person single room occupancy. USD$3,395.00 per person single room occupancy. USD$3,295.00 per person share twin/Double. USD$4,395.00 per person single room occupancy. USD$4,995.00per person single room occupancy. Optional Rugby World Cup match ticket costs. Two (2) nights accommodation in Osaka including taxes and breakfast. Check in Wednesday Septemer 25, cehck out Friday September 27. Note: If you are joining Travel Module #3, also in Osaka, from Travel Module #2 you will remain in the same hotel, if you have selected the same hotel category. 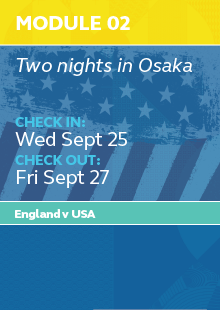 (a) Sunday September 26; Round trip local train transfer between your hotel andKobe Misaki Stadium for USA vs England. (b) Friday September 27; Your rechargeable Rail Transit card will have credit already loaded to cover the costs from the closest rail station to either of the Osaka Central train stations. From there, connect via JR Line direct rail service to Kansai International Airport or connect via the airport Monorail to Osaka (Itami) International Airport. If you are continuing on to another city on the Bullet train from Osaka Central Station you can use the remaing credit on your rail card in the next city you visit. Option to purchase One (1) Category B or One (1) Category D match ticket per module purchased, per traveller, to the Eagles game v England. Your Travel Module package price includes all ticketing, administration and distribution fees. In each of USAET hotels we will have an information and match ticket distribution desk operating from 2pm the day before the match. Where several hotels are close together we will allcoate a convenient central location serving all hotels. Rechareable rail transit cards will be distributed upon check in along with match tickets at the USAET information desks. Due to the fact guests will be arriving from multiple airports/stations at varying times and on a variety of airlines/trains we do not include transport to the hotel on day 1. (Wednesday September 25) We will supply full detailed directions prior to departure. The following are our suggestions. From Airport JR Line station directly to Tennoji Station. (Approx. 1 hour travel time via express train). Hourly service, cost approximately US$25, bookable with cash (YEN) and credit card upon arrival. Then taxi to the hotel approximately US$25. From Airport baggage claim (both terminals) directly to Osaka Central Station via Airport Limousine bus, (Approx. 50 minutes travel time). Every 40 minutes, cost approximately US$8, bookable with cash (YEN) and creidt card upon arrival. Then taxi to the hotel approximately US$15. Four (4) nights accommodation in Osaka including taxes and breakfast. Check in Friday September 27, check out Tuesday October 1. Note: If you select this Travel Module (#3) and you have also selected Travel Module #2 you will remain in the same hotel if you select the same hotel category. (a) Saturday September 28; Round trip local train transfer between your hotel and Hanazono Rugby Stadium for Argentina v Tonga match OR, round trip coach transportation to City of Toyota Stadium for South Africa v Africa 1. (b) Monday September 30; Round trip local train transfer between your hotel and Kobe Misaki Stadium for Scotland v Play-off Winner. (c) Tuesday October 1; Your rechargeable Rail Transit card will have credit already loaded to cover the costs from the closest rail station to either of the Osaka Central train stations. From there, connect via JR Line direct rail service to Kansai International Airport or connect via the airport Monorail to Osaka (Itami) International Airport. If you are continuing on to another city on the Bullet train from Osaka Central Station you can use the remaining credit on your rail card in the next city you visit. 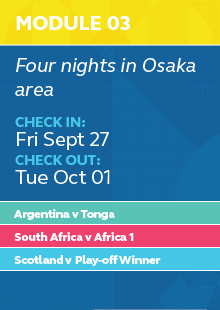 Option to purchase One (1) Category B or One (1) Category D match ticket per module purchased, per traveller to the Argentina v Tonga or South Africa v Africa1, and Scotland v Play-off Winner. Your Travel Module package price includes all ticketing, administration and distribution fees. In each of USAET hotels we will have an information and match ticket distribution desk. Where several hotels are close together we will allocate a convenient central location serving all hotels. Rechargeable rail transit cards wil lbe distributed upon check in along with match tickets at the USAET information desks. Due to the fact guest will be arriving from multiple airports/stations at varying times and on a variety of airlines/trains we do not include transport to the hotel on day 1. (Friday September 27) We will supply full detailed directions prior to departure. The following are our suggestions. From Airport JR Line station directly to Tnnoji Station (Approx 1 hour travel time via express train). Hourly service, cost approximately US$25, bookable with cash (YEN) and credit card upon arrival. Then taxi to the hotel approximately US$25. From Airport baggage claim (both terminals) directly to Osaka Central Station via Airport Limousine bus, (Approx. 50 minutes travel time). Every 40 minutes, cost approximately US$8, bookable with cash (YEN) and credit card upon arrival. Then taxi to the hotel approximately US$15. Two (2) nights accommodation in Fukuoka including taxes and breakfast. Check in Tuesday October 1, check out Thursday, October 3. (a) Wednesday October 2; Round trip local train transfer between your hotel and Fukuoka Kuko Airport subway station from where it is a 30 minute walk to the stadium for USA v France. (b) Thursday October 3; Your rechargeable Rail Transit card will have credit already loaded to cover the costs from the closest subway station to either Hakata Bullet Train Station or Fukuoka Kuko International and Domestic Airport. Option to purchase One (1) Category B or One (1) Category D match ticket, per module purchased, per traveller to USA v France. Your Travel Module package price includes all ticketing, administration and distribution fees. In each of USAET hotels we will have an information and match ticket distribution desk operating from 2pm the day before the match. Where several hotels are close together we will allocate a convenient central location serving all hotels. Rechargeable rail transit cards will be distributed upon check in along with match tickets at the USAET information desks. Due to the fact guests will be arriving from multiple airports/stations at varying times and on a variety of airlines/trains we do not include transport to the hotel on day 1. (Tuesday October 1) We will supply full detailed directions prior to departure. The following are our suggestions. Due From the airport it is within 20 minutes subway ride (Approx. US$3) to the closest subway station to your hotel followed by a 15 minute walk. A taxi from the airport to the hotel is approximately US$20. Five (5) nights accommodation in Tokyo including taxes and breakfast. Check in Thursday October 03, check out Tuesday 08. Note: If you are joining Travel Module #6, also in Tokyo, from Travel Module #5 you will remain in the same hotel. (a) Friday October 4; Round trip Bullet Train transportation from Tokyo Station to Shizuoka for South Africa v Italy. (b) Saturday October 5; Round trip Bullet Train transportation from central Tokyo and Tokyo Station for Shizuoka for England v Argentina. (c) Sunday October 06; Round trip local Train transfers between central Tokyo and Tokyo Stadium for New Zealand v Africa1. (d) Tuesday October 08; Your rechargeable Rail Transit card will have credit already loaded to cover the costs for the Narita Express to Narita Airport or the JR Line and Airport Monorail to Haneda Airport. If you are continuing on to another city on the Bullet train from Tokyo Central Station you can use the remaining credit on your rail card in the next city you visit. 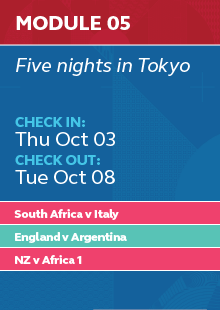 Option to purchase One (1) Category B or One (1) Category D match ticket per module purchased, per traveller to South Africa v Italy, England v Argentina, and New Zealand v Africa1. Your Travel Module package price includes all ticketing, administration and distribution fees. In each USAET hotels we will have an information and match ticket distribution desk. Where several hotels are close together we will allocate a convenient central location serving all hotels. Rechargeable rail transit cards will be distributed upon check in along with match tickets at the USAET information desks. In Due to the fact guests will be arriving from multiple airports/stations at varying times and on a variety of airlines/trains we do not include transport to the hotel on day 1. (Thursday October 3) We will supply full detailed directions prior to departure. The following are our suggestions. From Airport baggage claim (all terminals) directly to hotel lobby via Airport Limousine bus, (Approx. 2 hours travel time). Limited service, cost approximately US$31, bookable with cash (YEN) and credit card upon arrival or in advance on the internet. Alternate option is the Narita Express train departing all terminals from Tokyo Central Station (Approx. 1 hour travel time). Half hourly service, current cost US$32, bookable with cash (YEN) and credit card upon arrival. Then either local train transfer to the closest station to your hotel or taxi. USD$1,395.00 per person share twin/Double. Optional Rugby World match ticket costs. Two (2) nights accommodation in Tokyo including taxes. Check in Tuesday October 8, check out Thursday 10. Economy, Premium, Superior and First Class accommodations include breakfast – Eagles Nest accommodations does not. 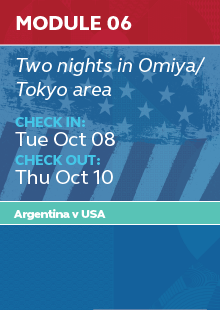 (a) Wednesday October 9; Round trip rail transfer from your hotel to Tokyo Bullet Train Station and Bullet Train transfer from Tokyo Central station to Kumagaya Station (40 minutes each way) for USA v Argentina. (c) Thursday October 10; Your rechargeable Rail Transit card will have credit already loaded to cover the costs for the Narita Express to Narita Airport or the JR Line and Airport monorail to Haneda Airport. If you are continuing on to another city on the Bullet train from Tokyo Central Station you can use the remaining credit on your rail card in the next city you visit. 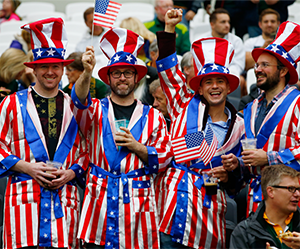 Option to purchase One (1) Category B or One (1) Category D match ticket per module purchased, per traveller, to the USA v Argentina. Your Travel Module package price includes all ticketing, administration and distribution fees. If you are Travelling to Tokyo on an International airline ticket purchased from USA Eagles Tours/JTB, our representatives at Narita or Haneda airports will meet you upon arrival, assist you onto your allocated transport to your accommodations and distribute any final tour documentation. In each of USAET hotels we will have an information and match ticket distribution desk. Where several hotels are close together we will allocate a convenient central location serving all hotels. From Airport baggage claim (all terminals) directly to hotel lobby via Airport Limousine bus, (Approx. 2 hours travel time). Limited service, cost approximately US$31, bookable with cash (YEN) and credit card upon arrival or in advance on the Internet. Alternate option is the Narita Express Airport train departing all terminals for Tokyo Central Station (Approx. 1 hour travel time). Half hourly service, current cost US$32, bookable with cash (YEN) and credit card upon arrival. Then either local train transfer to the closest station to your hotel or taxi. From Airport baggage claim (all From Airport baggage claim (all terminals) directly to hotel lobby via Airport Limousine bus, (Approx. 1 hours travel time). Limited service, cost approximately US$10, bookable with cash (YEN) and credit card upon arrival or in advance on the internet. Alternate option is taxi. Approximately US$60, 30 minute travel time. Note: If you are travelling on to Osaka to join Travel Module #7 we can assit you with the purchase of Bullet train rail travel on Thursday October 10 from Tokyo to Osaka. 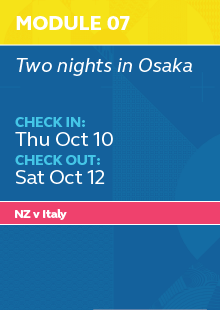 Two (2) nights accommodation in Osaka including taxes (Check in Thursday October 10; check out Saturday October 12, 2019) and breakfast. Select your accommodation choice from Standard, Superior or First Class. Note. 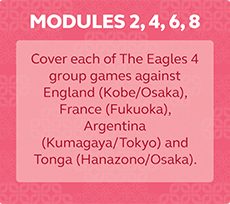 If you are joining Travel module #8 (USA v Tonga) also in Osaka, from Travel Module #7 you will remain in the same hotel in Osaka unless you have chosen The Eagles Nest option for Travel Module #8. (a) Saturday October 12; Round trip transportation from the hotel to the City of Toyota Stadium for New Zealand v Italy. (b) Saturday October 12; Your rechargeable Rail Transit card will have credit already loaded to cover the costs from the closest rail station to either of the Osaka Central train stations. From there, connect via JR Line direct rail service to Kansai International Airport or connect via the airport Monorail to Osaka (Itami) International Airport. If you are continuing on to another city on the Bullet train from Osaka Central Station you can use the remaining credit on your rail card in the next city you visit. One (1) Category D match ticket per module purchased, per traveller to the 2019 Rugby World Cup. Your travel Module package price includes the match tickets and all ticketing, administration and distribution fees. You have the option to upgrade the match ticket from category D to category B. To do this, complete the relative section on the Booking Form. In each of USAET hotels we will have an information and match ticket distribution desk. Where several hotels are close together we will allocate a convenient central location serving all hotels. Rechargeable rail transit cards will be distributed upon check in along with match tickets at the USAET information desks. Due to the fact guests will be arriving from multiple airports/stations at varying times and on a variety of airlines/trains we do not include transport to the hotel on day 1. (Thursday October 10) We will supply full detailed directions prior to departure. The following are our suggestions. From Airport baggage claim (both terminals) directly to Osaka Central Station via Airport Limousine bus, (Approx. 50 minutes travel time). Every 40 minutes, cost approximately US$8, bookable with cash (YEN) and credit card upon arrival. Then taxi to the hotel approximately US$1. USD$995.00 per person share twin/Double. USD$1,295.00 per person single room occupancy. USD$200 per person, per ticket to upgrade from Category D to Category B. Two (2) nights accommodation in Osaka including taxes. Check in Saturday October 12, check out Monday 14. Economy, Standard, Premium, and First class accommodations include breakfast – Eagles Nest does not. Note: If you are joining Travel module #8, from Travel Module #7, also in Osaka, you will remain in the same hotel if you select the same hotel category. 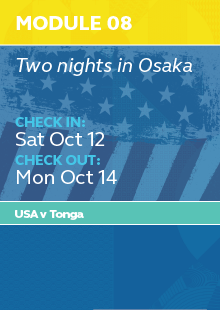 (a) Sunday October 13; Round trip rail transfer from your hotel to Hanazono Rugby Stadium for the USA v Tonga. (b) Monday October 14; Your rechargeable Rail Transit card will have credit already loaded to cover the costs from the closest rail station to either of the Osaka Central train stations. From there, connect via JR Line direct rail service to Kansai International Airport or connect via the airport Monorail to Osaka (Itami) International Airport. If you are continuing on to another city on the Bullet train from Osaka Central Station you can use the remaining credit on your rail card in the next city you visit. Option to purchase One (1) Category B or One (1) Category D match ticket, per module purchased, per traveller to the Eagles game v Tonga. Your Travel Module package price includes all ticketing, administration and distribution fees. Due to the fact guests will be arriving from multiple airports/stations at varying times and on a variety of airlines/trains we do not include transport to the hotel on day 1. (Saturday October 12) We will supply full detailed directions prior to departure. The following are our suggestions. From Airport JR Line station directly to Tennoji Station. (Approx.1 hour travel time via express train). Hourly service, cost approximately US$25, bookable with cash (YEN) and credit card upon arrival. Then taxi to the hotel approximately US$25. USD$495.00 per person share twin/Double. USD$545.00 per person single room occupancy. USD$595.00 per person share twin/Double. USD$895.00 per person single room occupancy. USD$695.00 per person share twin/Double. USD$995.00 per person single room occupancy. USD$895.00 per person share twin/Double. Three (3) nights accommodation in Fukuoka including taxes and breakfast. Check in Friday October 18, check out Monday October 21. Hakata Central Rail Station (Fukuoka) and Oita Rail Station for Rugby World Cup Quarter Final #1 and #3. Round trip Rugby World Cup shuttle transport will operate from central Oita to the stadium. Bullet Train Station or Fukuoka Kuko International and Domestic Airport. 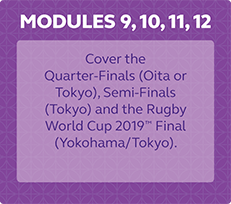 One (1) Category D match ticket per module purchased, per traveller, to each of the Rugby World Cup Quarter Finals (#1 and #3). Your Travel Module package price includes the match tickets and all ticketing, administration and distribution fees. You have the option to upgrade the match tickets from category D to category B. To do this, complete the relative section on the Booking Form. Due to the fact guests will be arriving from multiple airports/stations at varying times and on a variety of airlines/trains we do not include transport to the hotel on day 1. (Friday October 18) We will supply full detailed directions prior to departure. The following are our suggestions. From the airport it is within 20 minutes subway ride (approx. US$3) to the closest subway station to your hotel followed by within 15 minutes walk. A taxi from the airport to the hotel approximately US$20. Costs to Upgrade Match Tickets from Category D to Category B. Three (3) nights accommodation in Tokyo including taxes and breakfast. Check in Friday October 18, check out Monday October 21. (a) Saturday October 19; Round trip local Train transfers between central Tokyo and Tokyo Stadium for Rugby World Cup Quarter Final #2. (b) Sunday October 20; Round trip local Train transfers between central Tokyo and Tokyo Stadium for Rugby World Cup Quarter Final #4. (c) Monday October 21; Your rechargeable Rail Transit card will have credit already loaded to cover the costs for the Narita Express to Narita Airport or the JR Line and Airport Monorail to Haneda Airport. If you are continuing on to another city on the Bullet train from Tokyo Central Station you can use the remaining credit on your rail card in the next city you visit. 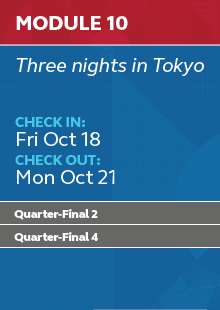 One (1) Category D match ticket per module purchased, per traveller, to each of the Rugby World Cup Quarter Finals in Tokyo (# 2 and 4). Your Travel Module package price includes the match tickets and all ticketing, administration and distribution fees. You have the option to upgrade the match tickets from category D to category B. To do this complete the relative section on the Booking Form. Due to the fact guests will be arriving from multiple airports/stations at varying times and on a variety of airlines /trains we do not include transport to the hotel on day 1. (Friday October 18) We will supply full detailed directions prior to departure. The following are our suggestions. USD$1,495.00 per person share twin/Double. USD$1,595.00 per person single room occupancy. USD$1,795.00 per person share twin/Double. USD$2,295.00 per person share twin/Double. USD$2,695.00 per person single room occupancy. USD$2,595.00 per person share twin/Double. USD$3,495.00 per person single room occupancy. Cost to Upgrade Match Tickets from Category D to Category B. Three (3) nights accommodation in Tokyo including taxes and breakfast. Check in Friday October 25; check out Monday October 28. (a) Saturday October 26; Round trip local Train transfers between central Tokyo and International Stadium Yokohama for Rugby World Cup Semi-Final #1. (b) Sunday October 27; Round trip local Train transfers between central Tokyo and International Stadium Yokohama for Rugby World Cup Semi-Final #2. (c) Monday October 28; Your rechargeable Rail Transit card will have credit already loaded to cover the costs for the Narita Express to Narita Airport of the JR Line and Airport Monorail to Haneda Airport. If you are continuing on to another city on the Bullet train from Tokyo Central Station you can use the remaining credit on your rail card in the next city you visit. 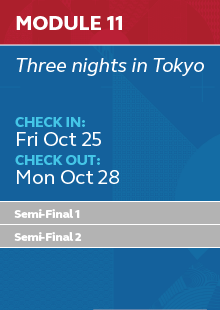 One (1) Category D match ticket per traveller to each of the Rugby World Cup Semi-Finals in Yokohama (# 1 and 2). Your Travel Module package price includes the match tickets and all ticketing, administration and distribution fees. You have the option to upgrade the match tickets from category D to category B. To do this complete the relative section on the Booking Form. If you are Travelling to Tokyo on an International airline ticket purchased from USA Eagles Tours/JTB, our representatives at Narita or Haneda airports will meet you upon arrival, assist you onto your allocated Airport Limousine to your accommodations and distribute any final tour documentation. In each of USAET hotels we will have an information and match ticket distribution desk. Where several hotels are close together we will allocate a convenient central location serving all hotels. Due to the fact guests will be arriving from multiple airports/stations at varying times and on a variety of airlines/trains we do not include transport to the hotel on day 1. (Friday October 25) We will supply full detailed directions prior to departure. The following are our suggestions. From Airport baggage claim (all terminals) directly to hotel lobby via Airport Limousine bus, (Approx. 1 hours travel time). Limited service, cost approximately US$10, bookable option is taxi. Approximately US$60, 30 minutes travel time. Three (3) nights accommodation in Tokyo including taxes and breakfast. Check in Thursday October 31; check out Sunday November 03. 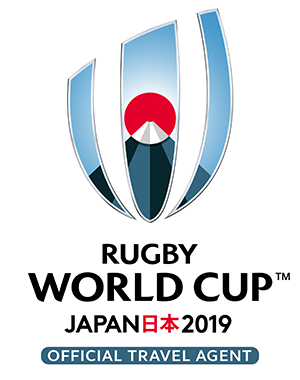 (a) Saturday November 02; Round trip local Train transfers between central Tokyo and International Stadium Yokohama for The 2019 Rugby World Cup Final. (b) Sunday November 3; Your rechargeable Rail Transit card will have credit already loaded to cover the costs for the Narita Express to Narita Airport or the JR Line and Airport Monorail to Haneda Airport. If you are continuing on to another city on the Bullet train from Tokyo Central Station you can use the remaining credit on your rail card in the next city you visit. 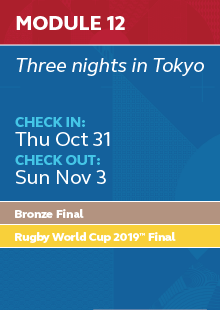 One (1) Category D match ticket per traveller to the 2019 Rugby World Cup Final in Yokohama. Your Travel Module package price includes the match ticket and all ticketing, administration and distribution fees. You have the option to upgrade the match ticket from category D to category B. To do this complete the relative section on the Booking form. Note. You may add a match ticket to the Bronze Final match at Tokyo Stadium on Friday November 01 (the day before the World Cup final). To do this complete the relative section on the Booking Form. Due to the fact guests will be arriving from multiple airports/stations at varying times and on a variety of airlines/trains we do not include transport to the hotel on day 1. (Thursday October 31) We will supply full detailed directions prior to departure. The following are our suggestions. From Airport baggage claim (all terminals) directly to hotel lobby via Airport Limousine bus, (Approx. 2 hours travel time). Limited service, cost approximately US$31, bookable with cash (YEN) and credit card upon arrival. Then either local train transfer to the closest station to your hotel or taxi.